Cushions seem to make a home more homelier, These gorgeous floral cushions on the couch are about to appear in the next Country Style, in mega talented Glen Proebstel's outdoors shoot. 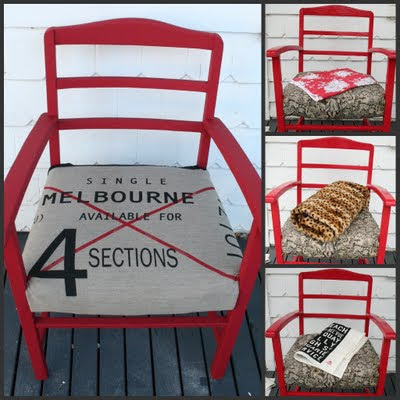 The other ticket Cushions are our designs and are printed in Melbourne on Linen designed using old train tickets. They are available at the shop for $95. There are a more designs in the shop. My favourite Stylist Heather Nette King recently covered this chair in our fabric. We also have the fabric available to frame or use at Patchwork on Central Park. there are quite a few different ones as a new shipment has just arrived.